Though today's refrigerators and freezers are typically part of a single appliance, they maintain distinct functional differences. Each appliance has its own purpose, requirements and problems, and being aware of these differences can help you get the most use out of your refrigerator and freezer. Refrigerators and freezers have different costs and requirements. Refrigerators are most appropriate for perishables such as meats, dairy and cooked food. The U.S. Department of Agriculture recommends that you throw away raw meats with two days of placing them in the refrigerator, and that you throw away leftovers within four days. If you don't plan to use food within two days, you can freeze it for one month to a year, depending on what it is. Some foods, such as root vegetables, tomatoes and peppers, deteriorate in the refrigerator and freezer. Store them in your pantry or on the counter instead. Per USDA guidelines, your refrigerator keeps food safe from harmful microorganisms at 40 degrees F. Should the food become warmer than 40 degrees, you must use it within two hours to prevent the overgrowth of microorganisms. 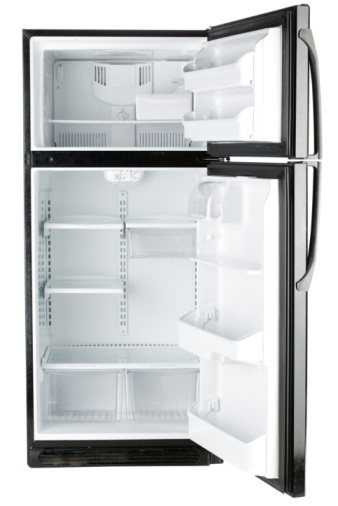 Set the thermostat in your freezer to 0 degrees F.
Refrigerators sometimes keep food too cold so that it freezes. This may be because you set the thermometer too low or it could indicate that the coils on the condenser coils on the outside of the appliance are dusty. It may also be a problem that requires professional repair. Home expert Don Vandervort of HomeTips.com recommends cleaning your refrigerator coils at least once per year to avoid problems. Freezers may not become cold enough, resulting in spoiled food. They may also become too cold. Contact an appliance mechanic if you experience problems with your freezer even after setting the thermostat to 0 degrees and dusting the condenser coils. Refrigerator-freezer combinations and standalone freezers typically require between 300 and 400 watts of energy to operate. A side-by-side refrigerator-freezer combination uses almost twice that amount. Your electricity bill likely reflects this fact, as it can cost three times as much per month to run a side-by-side refrigerator than any other type of refrigerator or freezer.